Before I begin, let me preface my little rant by saying that yes, I have a Kindle - and I enjoy using it. I have the complete works of HP Lovecraft on there, which is more than can be said for my bookshelf! Still, recently I've seen a few touting this as 'the end of the physical book', and after despairing slightly at the arguments included in Imagine, I decided my own version was more than due. (This isn't egocentric - well, it's not entirely egocentric). A book isn't just its content - and page and screen aren't interchangable. When you own an ebook, what you own is a file. Useful, yes. But when you own a hardcopy, you not only own the content, you own a physical object. If your concept of a book is just its words, then you'd be right in saying the difference doesn't matter. Its impact, however, comes in ownership. A physical book can be placed on a bookshelf - displayed, lent, and shown off. In the nicest possible way, of course. With an ebook, you don't have that pleasure in ownership - I mean, who puts a file on their bookshelf? There's also the DRM issue. While I believe authors should be paid for their work - illegally copying books is theft in my mind - proprietary formats have problems. While I assume you'll always retain the ability to read - and thus will always be able to read your hardcopies - I can't make the same assumption about having the same ereader. Yes, you could convert formats: but with proprietary types, that's dubious at best. Aside from these, there are more practical concerns. Yes, you can search an ebook - but it's not the same as flipping through a hardcopy. Yes, the Kindle's new annotations feature is nice - but is it really as useful as margins. Both features are nice, but they complement a hardcopy, not replace it: I love the 'search' feature, but it's not so useful for finding our place. Likewise, it's difficult to find the quote you want in a hardcopy, but it's easy to find the section you need. They're not interchangable - but both are good. And, of course, the crazed sentimentality. Dammit, there's something lovely and tactile and... Well, I'm not making this sound any better, am I? Let's just say I like physical books better as objects. So, here are my big four reasons why I'll never move solely to ebooks - be they ever so practical. I love my Kindle and it doesn't break my back when I upload Stephenson tomes onto it, but it'll never usurp my bookshelf. Don't even get me started on the physical, tactile, "bookness" of a, well, physical, tactile book. I'm sure digital is great for whopping collections that you're never going to find and won't fit on your shelves (such as said Lovecraft). . . but eh, prints books aren't going anywhere anytime soon. I totally agree - and that's my big sentimentality point as well, though I was trying to go for other arguments as well. A book isn't just a bunch of images and text strung together in a file! Digital's useful, but I'll use it to try a book out, then buy it in hardcopy if I really like it. 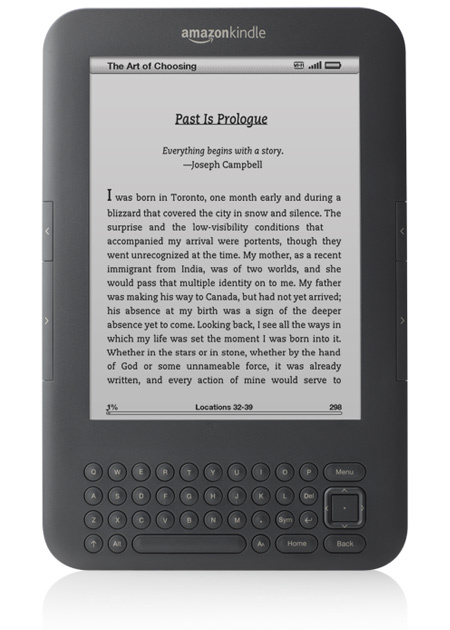 I also have a Kindle and I love it, because it's a great way to read a book. I can have hundreds of these eBooks and download them from sites like All You Can Books, where I can get them for free. Of course, it won't replace my printed books, but it's a great alternative when I must travel somewhere and I don't want to carry those heavy books.